The transition process at the African Union Commission has begun, following a meeting between newly elected chairman Moussa Faki Mahamat — Chad's foreign minister — and outgoing chairperson of the commission, Nkosazana Dlamini Zuma. In addtion, the outgoing chairman of the African Union, Chadian President Idris Debby, met Guinean President Alpha Conde — the incoming chairman — at the African Union's headquarters at the Ethiopian capital, Addis Ababa, according to Jacob Enoh Eben, spokesperson for the former chairperson of the African Union Commission. The new African Union Commission head would have about three months to set up his cabinet. 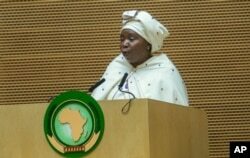 FILE - African Union Commission Chairperson Nkosazana Dlamini Zuma delivers a speech during the opening ceremony of the African Union Summit in Ethiopian capital Addis Ababa, Jan. 30, 2016. "In the case of this current transition … the three months would be April, so they can go as fast as they want, but they would have a maximum of three months," Eben said. Eben expressed confidence that the newly elected head of the commission would move swiftly to assemble his cabinet. "Probably, within a month's period, you would hear them appointing the key staff, the chief of staff, key advisers with whom they would be working with, and even including members of the secretariat," Eben said. At the just-ended African Union summit of heads of state and government in Ethiopia, the leaders resolved to pull out of the United Nations-backed Hague-based International Criminal Court (ICC) unless the court undergoes some changes. The African Union previously had urged members not to cooperate with the ICC, after accusing the court of targeting Africans. Kenyan President Uhuru Kenyatta and Deputy President William Ruto had cases against them dropped by the ICC, while Sudanese President Omar Hassan al-Bashir is under indictment for alleged human rights violations and crimes against humanity. Botswana is among the few countries in Africa to defy the continental body's call for member countries not to cooperate with the ICC.